Textually Active! Brightkite Group Text Brightkite Group Text is here! Group Text – Free, Unlimited, Group Text Messaging from your iPhone or iPod Touch! The “Reply All” has finally arrived in the world of texting! Send a message, location, or pic to a group of friends and when the replies come in - everyone gets them! Get the iPhone App, visit m.brightkite.com on your mobile device or learn more about Brightkite Group Text here. Send texts to any phone number – not just Brightkite members! Add pictures and locations to your messages. Friends don't need to download a thing. Great for coordinating a picnic or a pot roast. Send Free Texts to Anyone!It’s true- the best things in life are free! Group Text won’t cost you a dime - good news for all of you trigger-happy texters! Instead of going over your text limit or paying more to send a pic… you and any of your friends can use Group Text on Brightkite for free… Keep on Texting! Opening another app on your phone? Remembering another password? Sounding like a broken record? 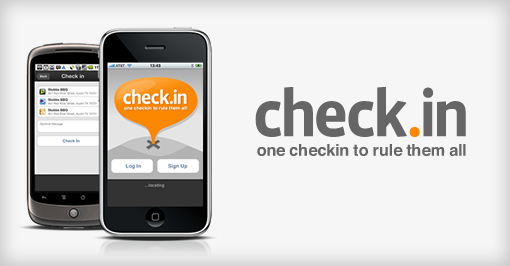 Take the hassle out of checking in on multiple services - use www.check.in to checkin on multiple services at once! Brightkite - of course ;), Gowalla, & Foursquare! Get a Beta Invite Now! 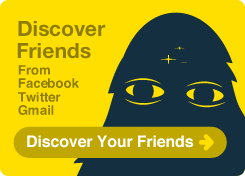 From back in the day to, well, ummmm… yesterday, find friends you already know on Brightkite with an instant search through your Facebook, Twitter, Gmail and Yahoo accounts. Share with your other social networks. Send posts and places to Twitter, Facebook and Flickr. Got something cool for this newsletter, just let us know. Last week Spotify told us that they submitted a new version of our iPhone app to Apple for approval. The approval process has been super quick and today we’re happy to announce that the update is now available in the app store. Save time and space by using tracks already stored on your iPod in your playlists - there’s no need to sync those track anymore. Spotify remembers when you were when you quit and starts up at the same location. The ability to sync your purchased Spotify tracks over Wifi. A new look for albums and playlists. The ability to set playlist as collaborative or not. The ability to search in playlists. The ability to create a new playlist from the Add to Playlist view. Playlists named “-” show up as separators. Album reviews added to album view. Volume slider uses system volume. Here you have some links! I hope the download links still works. Testing to write with zemanta chrome extension in gmail. I wonder if that could be useful when blogging or not? It could be useful because I blog a lot by mail. I used Zemanta quite much before when I was using Firefox. I stopped using it when I switched to Chrome. Zemanta is a pretty cool extension that recommends stuff while typing. Many people (including myself) have come to the conclusion that Gmail, with its threaded messages, spam filtering, and vast storage space, is one of the web’s best webmail providers. In fact, we like it so much that we use it for both our personal accounts and work accounts using Google Apps. But that also poses a problem: many of us wind up having to maintain two separate Google accounts, which means we have to swap logins whenever our Gmail, Reader, or other data is stored under the other account. Fortunately, there may be an end in sight for this juggling act. Find more info about Seesmic! Seesmic Web makes it easy to access your Twitter account from any browser and at any time. The new interface of Seesmic Web now brings to the forefront: Adjustable Column Size, Sounds, Mute / Un-mute Users, Location Trends, Inline Pictures and Video Previews. Just sign into http://seesmic.com/app/ and enjoy the changes. Manage your followers and who you follow in our recently released Contacts feature. Be able to look through and view all of your relationships on Twitter by reviewing their profile, add them to lists and easily manage your connections. By allowing much narrower columns, Seesmic Web becomes very usable on your notebook! Want to view more columns simultaneously and they seemed too large? Go to the left side of the screen and choose the width: small or wider! Missed important tweets because you did not check them in time? Seesmic Web alerts you when you've received Direct Messages, Replies or you've even sent tweets. Sounds are enabled by default and can be disabled by clicking on the second button of the top right bar. Ever wanted to hide someone from your Seesmic Web timeline when the tweets might have spoiled your surprise? You can do it now with the Mute feature! Clicking on the username, opens the profile preview and opting for Mute will exclude all the user's tweets only from your Seesmic Web platform. If you changed your mind, you can simply undo the process from Contacts. Seesmic web now lets you preview pictures and thumbnails of video directly from the timeline, without clicking on anything. It has never been easier to know what's behind all those shortened links! In Seesmic Web, you can adjust sound, replay or pause the video. Do you want to know what's setting trends in certain parts of the world or must-go-to cities? Seesmic Web now allows you the possibility to do it, whether in Europe, US or simply Worldwide. By going to Trending Topics Location, you can select the city of your choice or region that catches your eye and view the mostly talked about subject. We have also addressed the issue of being able to check and display all of your Contacts without any limitation. The opportunities to discover the benefits of Seesmic Web platform are numerous! Just let us know your opinion and we happy to listen to all your feedback! I got this cool news about a new Springpad iPhone App in my Inbox today! Springpad is a really cool service that is a bit like Evernote. The iPhone app is free. Find more info about SpringPad! Your Springpad Just Got an Update! We've spent the last couple of months hard at work making Springpad a better service that helps you remember the many little things you come across online and in the real world. We're excited to tell you about the improvements we've made to Springpad - it's a lot simpler and focused on providing you more ways to save and access the information that's important to you. Check out a summary of these new features (video) or just LOGIN now! It’s finally here! The Springpad iPhone App is the newest way to save and access all of the information you want to remember. - When you think of something you want to remember - just type it in! - Add wines, books, movies, products & more. Search for what you want to save & we'll populate the details. - Use GPS to save a Business or Restaurant near your current location. 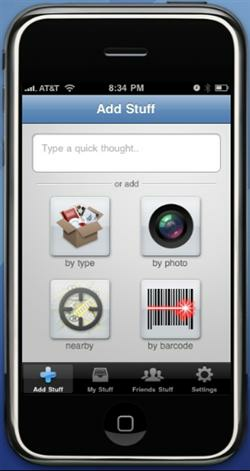 - Scan the barcode of a product or book you'd like to remember! - Everything syncs automatically back & forth with your account at Springpadit.com. We've taken your suggestions and put in a bunch of improvements to make the My Stuff section much more organized. Check out the new layout options, and new ways to search & filter. Also, we have a brand new way to add items to your system with automatic suggestions while you type. Read about what else is new. We've added some really useful enhancements to the data you save in Springpad. Things like quick links to menus, reviews, purchases & movie trailers. Also embedded information like maps, price comparisons & movie showtimes. Check it out! Save information from your email to your Springpad by simply emailing it in. We'll save it as a note, so you'll know the information you need is only a quick search away. Learn more about how to send an email to Springpad. We’ve also removed some things. Improvement also sometimes means removing things! In an effort to simplify Springpad, some features have been removed or changed. 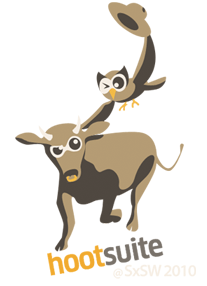 Find more info about Hootsuite! Just in time for SXSW, social butterflies can share favorite hot-spots with friends on Foursquare, plus bands and filmmakers can quickly connect with fans on MySpace - all from HootSuite's Social Media Dashboard. Don't know about Foursquare? This web juggernaut combines way-finding, social marketing and gaming in an addictive mobile app which encourages everyday socialites to "check in" at cafes, pubs, and conferences. They can alert friends, share tips, and even become "mayor" of a location. Note: CEO Ryan loves it. Of course, you know MySpace. The venerable web giant is the place where creative types hang out and share their work and is the first stop for discovering emerging and established bands and filmmakers. With HootSuite, artists can easily outreach to fans about shows, releases and screenings. P.S. Let's be MySpace friends. Are you headed to Austin for the massive interactive media, film, and music conference? Track us down to get your hands on some collectible cultural swag. We're also hosting Hoot-ups, giving demos and exploring the streets with the Owl in tow. Find us via the #hootsxsw hashtag plus this handy SXSW Twitter list. You don't have to be on the ground in Texas to enjoy the fun - just add Foursquare and MySpace to your HootSuite social networks and learn locals-only tips and/or find where your favorite band is playing next - right from your beloved dashboard. That ain't all - Marketing and stats enthusiasts take note that the custom URL parameters tool was enhanced in this release along with a batch of bug fixes and performance enhancements. Learn more about this release on the HootSuite blog.